This entry was posted on September 3, 2008 at 1:19 am and is filed under Animals. You can follow any responses to this entry through the RSS 2.0 feed. You can leave a response, or trackback from your own site. Latest in demobilization methods, a red hoodie. Completely guaranteed to work first time, every time. 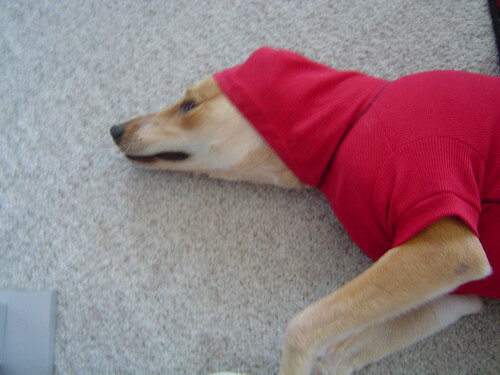 Just install hoodie on uncooperative pet and immediately, they fall on their side and remain motionless until released. For especially rambunctious pets, simply pull hoodie over eyes, you no longer need a separate eye cover!!! Comes with full money back guarantee. Simply return remaining hoodie to us and we will refund your purchase price minus the percentage of hoodie that is missing. Go Big Reddddddddd, Go Big Red!